If you want to view current months download statistics, you can view it here. Here you can view the list of all packages with number of downloads for each package in a table. If you click download count value for a package, you will redirected to details page for that package. If you click any day number, you will be redirected to Package vs User settings. Is it possible to see which registered / logged in users downloaded a particular file? Is it possible to generate a report of all downloads by users? Also I need a report of all users and their downloads. Thanks! How do you get stats per file (contained within a package) for single file downloads? 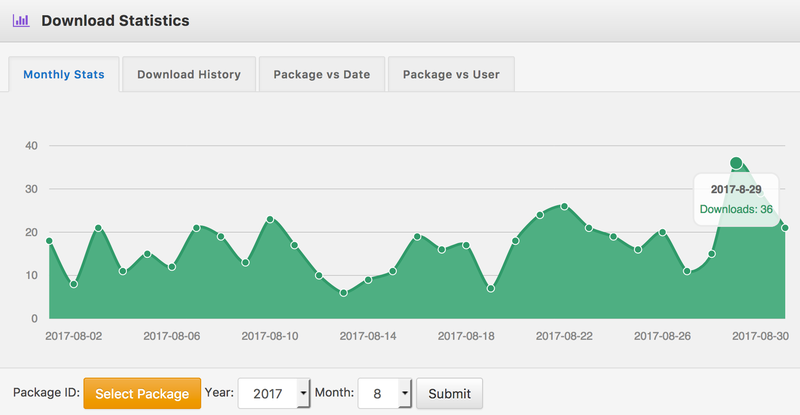 I have a site which currently has over 100 resources/packages available for download, is there a way to modify the “Package Vs Date” page to only show packages/resources which have been download, one user may have only downloaded 3 resources/packages but the page currently shows the 100+ available on the site. Hi. How to clear history download? From Admin Menu >> Downloads >> Settings >> Privacy Tab. Thanks, your suggestion is noted.